You’re on island time now folks, and it doesn’t get better than this! Prepare to be intoxicated by 50 shades of blue. Sometimes the best part of YOUR vacation is escapism. The chance to disconnect from our everyday day lives, live outside our comfort zone and see the world from a new perspective. 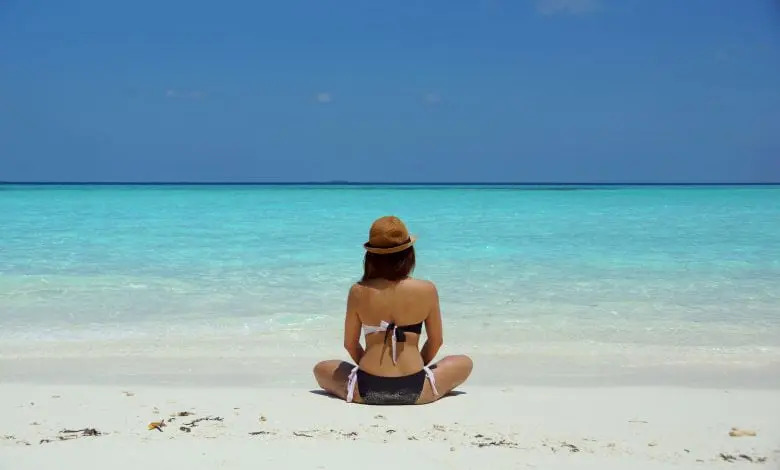 There is something thrilling and satisfactory about jetting off from the mainland by boat to retreat to an idyllic island in the middle of the ocean where you’re completely encapsulated by the color blue. Moving around when you get to your destination can daunt many people. I mean, I get it. I used to be like that. It’s new to you, you don’t your way around, and it’s scary. Some travelers prefer to stay put. But to get the most from your trip explore the very best of the region! Why the hell not #YOLO. To my surprise when I got here I couldn’t believe how cheap, easy, and safe it was to move around. It’s the reason I’m writing this to you now, I’ve experienced it all first-hand, I’m passionate about the beauty of the region and I implore you to take action and see it for yourself. Food and beverage (best places to eat and drink). Accommodation, guide, tips, and recommendations. Experience, tour & activity guide, tips, and recommendations. 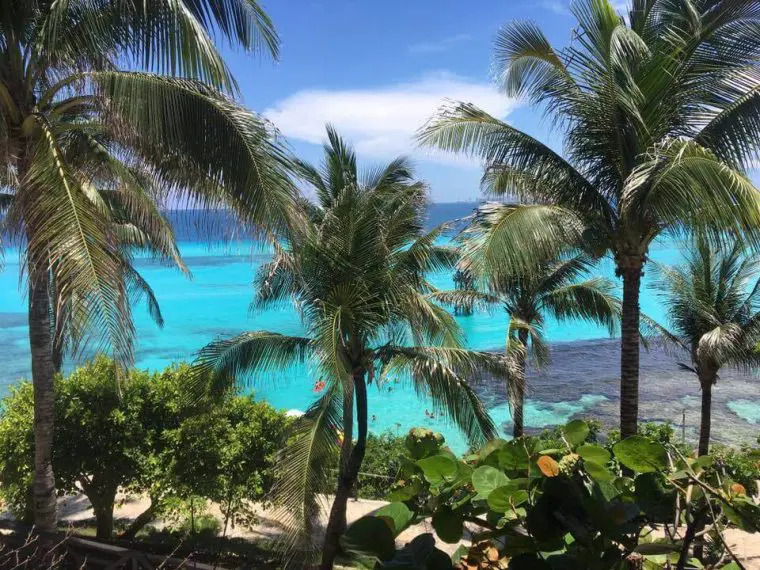 Keep this guide to Isla Mujeres in your pocket at all times by bookmarking it on your phone. 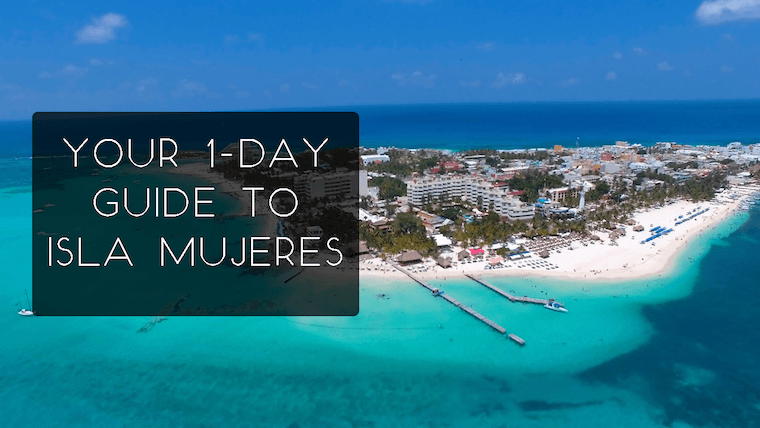 Follow this express itinerary step-by-step to ensure you get the very best out of your 24-hours in Isla Mujeres! 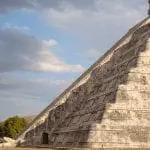 At the end of this itinerary, I will leave an easy breakdown of optional tours available on the island, places to eat or drink, and shopping attraction that you can choose from at your own free-will. It’s all the information you will ever need in one place. 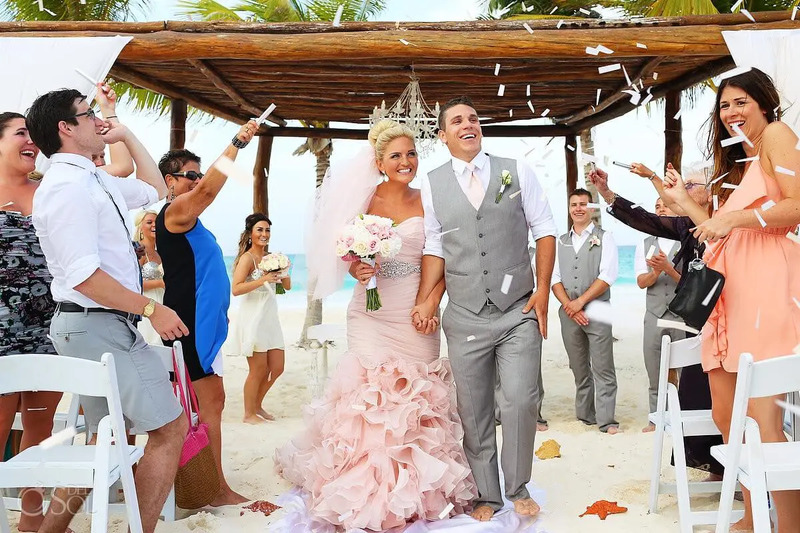 With my help, you’ll experience only the very best of Isla Mujeres (Woman’s Island). Expect to be intoxicated by unspoiled landscapes, meet new interesting people, and delve out of your comfort zone by trying new things. 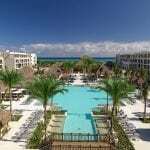 *Take cash with you to Isla Mujeres as a credit card is rarely accepted. 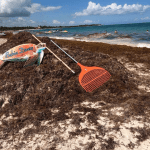 Once you’ve boarded the ferry from Cancun (more on that later in the transport section) it’s time to plunge yourself into the true rhythm of the tropics. When you step foot off the ferry you will be met by vendors at the port trying to sell you stuff, so if you didn’t do any research beforehand, chances are they will try and rip you off. 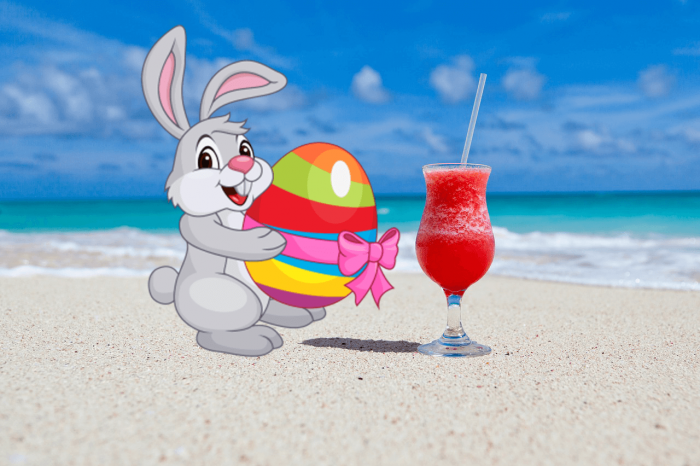 Luckily, you’re here reading this, so follow my plan and I guarantee you an amazing day on the island! ? Prepare for an action-packed adventure at Mangos Cafe! This cozy, casual, and kid-friendly eatery is the perfect place to fill up on a scrumptious breakfast. There are lots of different and tasty options at an affordable price. 10.00 am – Rent a Golf Buggy! Rent a golf buggy and have fun roaming free! Don’t worry, you can’t really get lost for too long, the island isn’t big enough. Be sure to park up carefully and to always take the keys with you. They are a lot of fun to drive. Hop back onboard your golf buggy and head to Punta Sur. Hands down one of the best things to do on the island. Prepare for spectacular views. Pay a small fee of $30 pesos to go out to the furthest point. You’ll get to experience breathtaking ocean views and a walk out on the coral trails. Be sure to wear good footwear for this as the trails can get slippery. Take a camera as views are particularly stunning. Acontillado is absolutely delicious and boasts SPECTACULAR views. It’s 2nd to none. 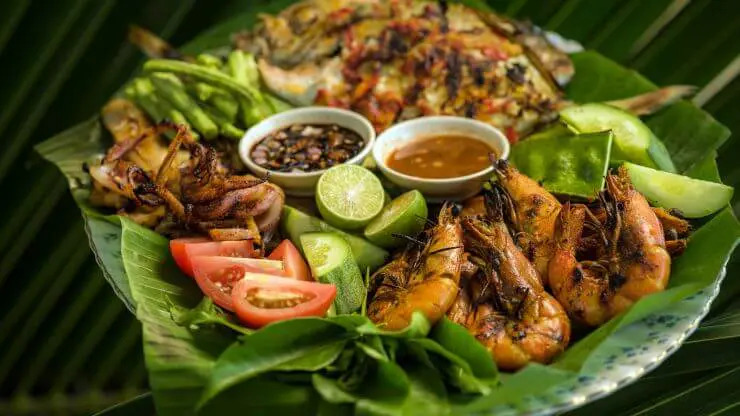 You have to try the Seafood Platter. 3 people can get full for $45 US Dollars. AMAZING! 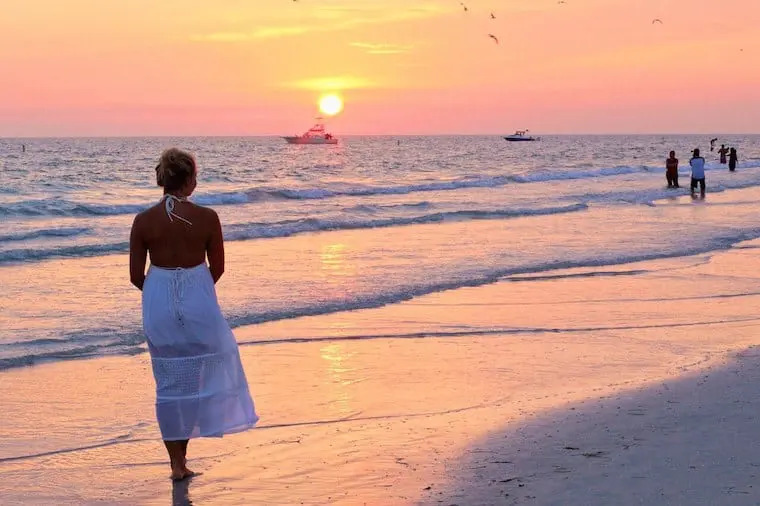 5.00 pm – Head to Playa Norte for Sunset! 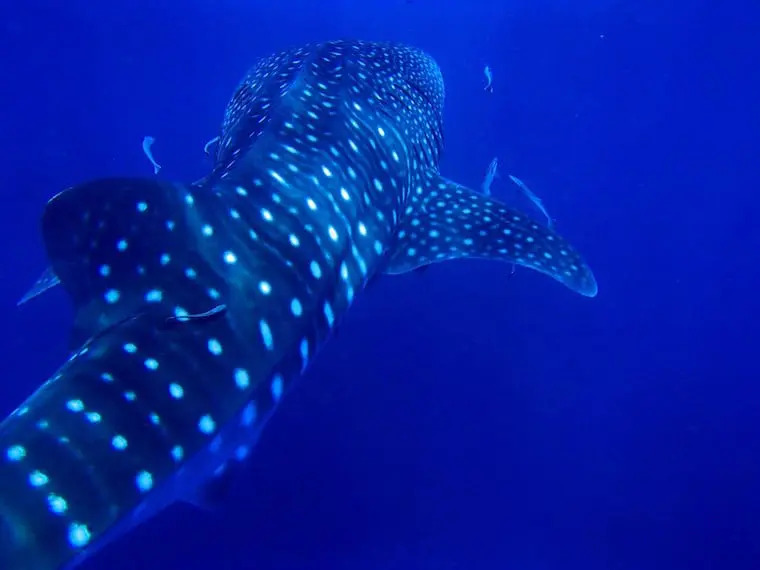 Watch an explosion of tropical hues take center stage on Isla Mujeres. Trust me on this one, you’ve never seen a sunset look so good! Go prepared with an ice cold beer. 😉 Don’t forget to take a camera as you’re guaranteed some totally insta-worthy shots. Savor the flavors of Morrocon inspired cuisine at Olivia’s. Top tip: make your reservation before you visit and try to bag a candlelit table out the back for a more memorable evening. 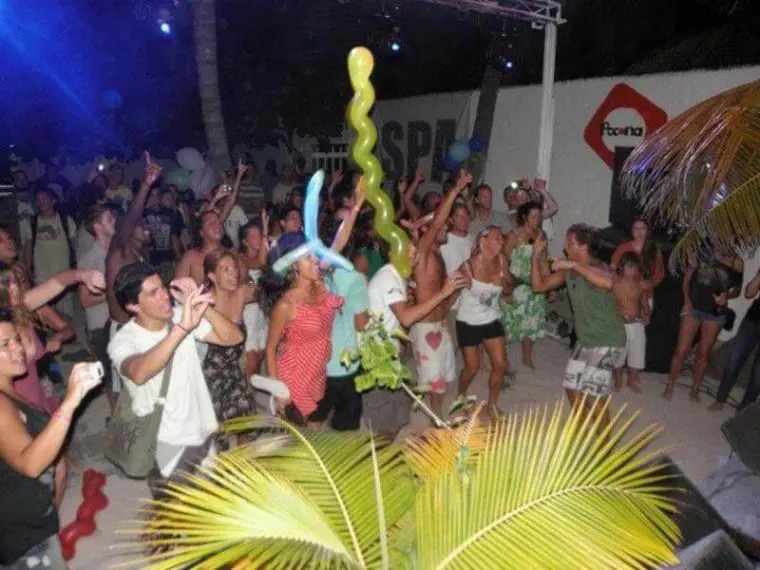 If you like to party then you’ve come to the right place, Isla Mujeres comes alive at night. Especially at the hostel Poc Na. This is where I stayed when I visited and I had one of the best nights of my life. 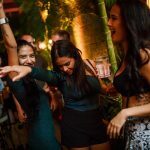 You don’t have to stay at the hostel to get a wristband for the parties either you can always drop by and buy one during the day. Cheap drinks, hammocks, great music, dancefloor, awesome beach, and hot guys! What’s not to love. Food & beverage guide, tips, and recommendations. With so many delicious eateries and juice bars to choose from, you’ll be spoilt for choice. Start your day on the south side of town and drop by this quirky cafe. This place boasts self-serve coffee and a hearty Caribbean-inspired breakfast. You have to try the hot coconut French toast (M$100) and eggs Benedict in a curry hollandaise sauce (M$125), it’s delicious! 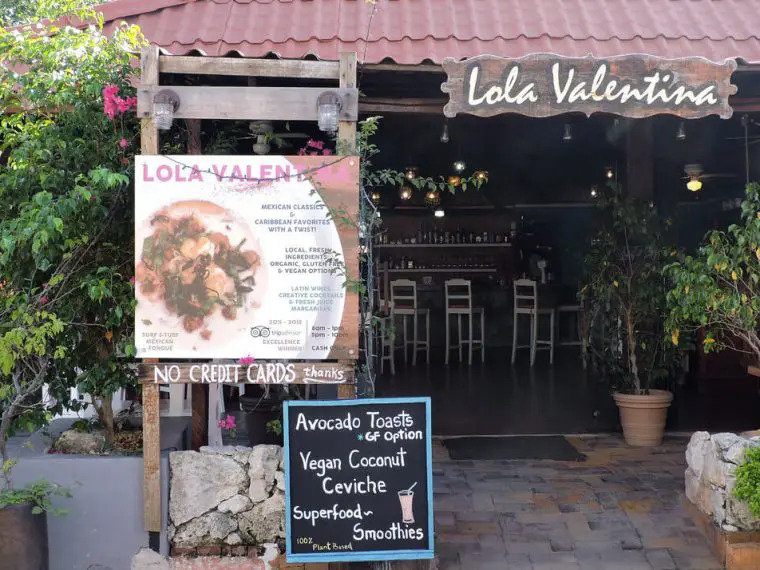 Overlooking the quieter north side of the restaurant strip you will find Lola Valentina. 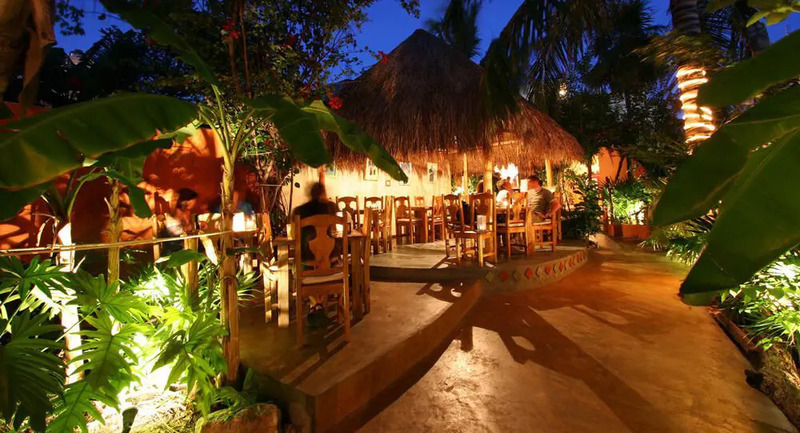 Here you will find tasty Mexican fusion dishes. The Thai-style shrimp tacos are to die for (M$175), you will also find a range of vegan, and gluten-free items too! They’ve added swings at the bar (fun) and redone their tasty cocktail menu (yum). 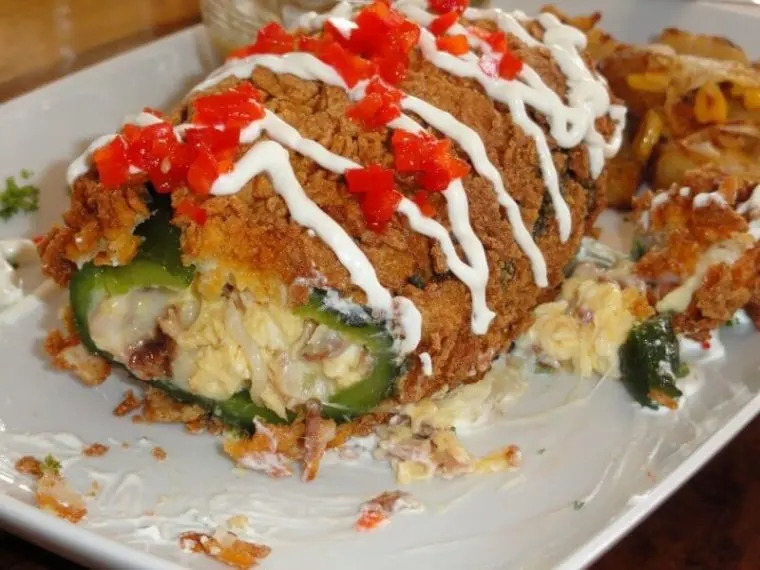 This delightful Israeli-run restaurant makes everything from scratch! Expect Moroccan-style fish served on a bed of couscous to chicken shawarmas wrapped in fresh-baked pita bread. If you can sit at a candlelit table in the back where Olivia (the cat) might stop by and say hi. Try the home-made cherry ice cream you won’t regret it. Closes mid-September to mid-October. Reservations recommended. Isla is a laid-back island that comes to life at night. If you can you should definitely stay the night and catch the ferry back the next day. Isla Mujeres has accommodation to suit all budgets. Poc-Na Hostel is a super cheap option for travelers staying for just one night. This is my favorite hostel on the island, it’s a beachfront location overlooking the Caribbean Sea and just 7 minutes from the ferry terminal. Simple private rooms and mixed dorms are available with lockers, fans, and shared bathrooms. You can upgrade if you book in advance to get quarters that come with air-conditioning or en-suite facilities. Daily yoga, free breakfast, a game room, volleyball court are just a few of the perks you can enjoy at this hostel. Great for party lovers. 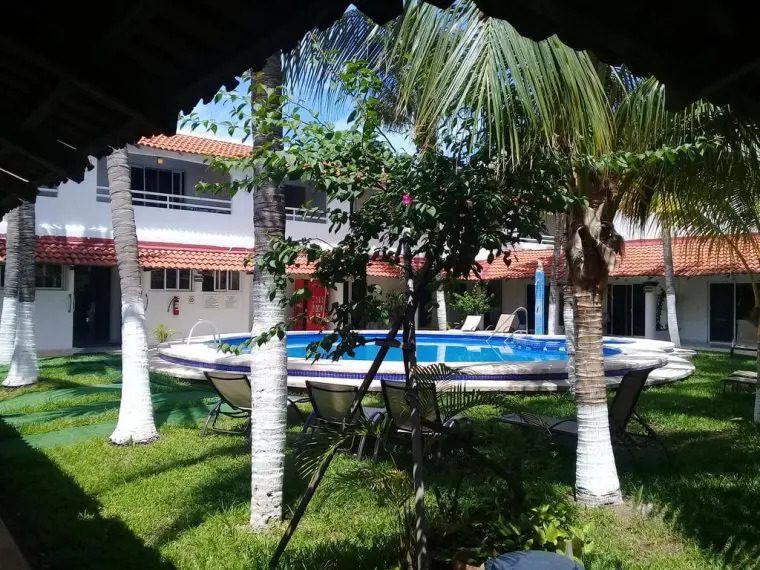 Hotel Plaza Almendros this affordable hotel is just a 4-minute walk from Norte Beach. This relaxed hotel is located on a street lined with restaurants and bars, and just a 6 minute walk from the ferry terminal. Featuring balconies or terraces with pool or street views, the unpretentious rooms come with kitchenettes, cable TV, and safes. There’s an outdoor pool surrounded by a lawn, palm trees, and sun loungers. Get the celebrity treatment at the world-class Izla Hotel (family-friendly). This resort features an outdoor pool and private beach area. Guests can enjoy international dishes at the on-site restaurant, or try out one of the many celebrated cocktails. All units in the hotel are fitted with a flat-screen TV. Every room comes with a private bathroom with a shower. Guests at Izla Hotel can enjoy an American breakfast. 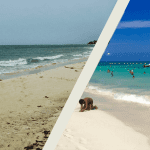 If you prefer to follow an itinerary set forth by one of our tour providers, I’ve listed my two favorite Isla Mujeres tours below. 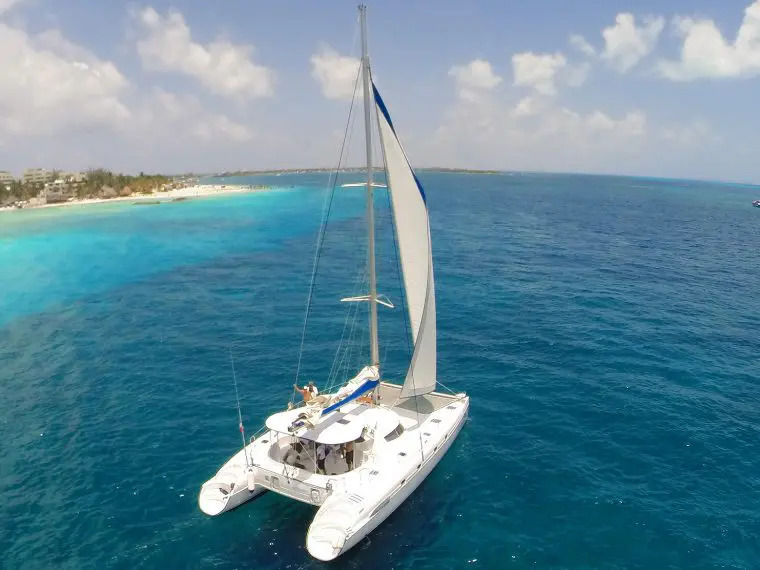 If you’re the type of person who likes to sit back, relax, and enjoy the moment while the logistics are taken care of, our Catamaran tour could be for you. 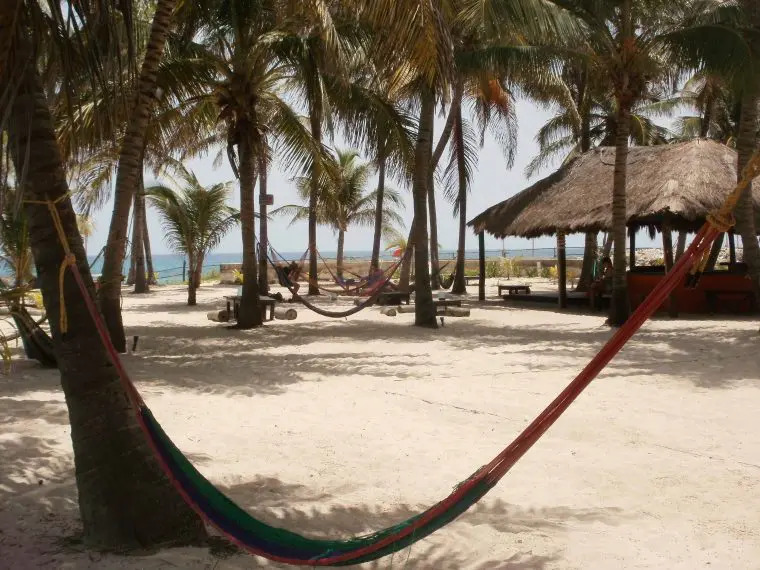 Sail the sea, snorkel, and relax at a private beach club before setting out to discover Isla Mujeres. Glide along the oceans enchanting shades of blue, and soak up some sun as you sip your refreshing drink. Your expert guides will take you to snorkel a portion of one of the world’s longest barrier reefs: The Mesoamerica Reef. After your snorkel adventure, you’ll get back onboard the catamaran for a short but pleasant sail to Isla Mujeres. 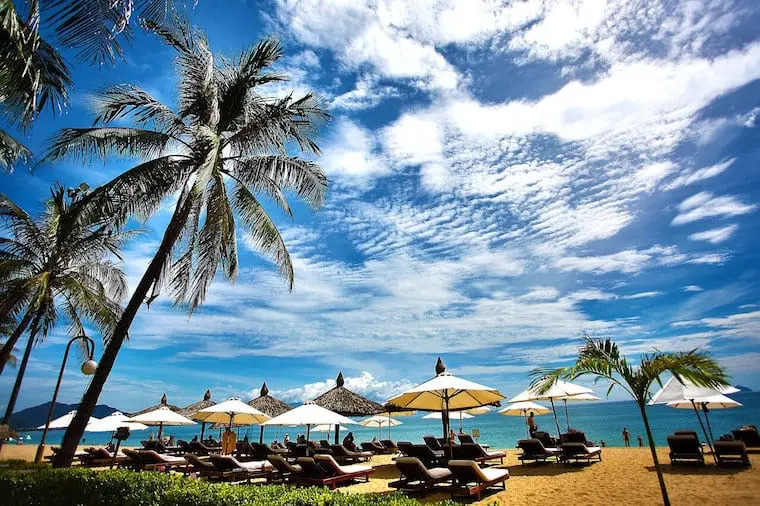 Once you reach the island, you’ll be greeted by the smiling staff at the local beach club, where you’ll be able to take in some drinks, lounge around on the white sand beach, swim in the bay and take in a typical lunch buffet. 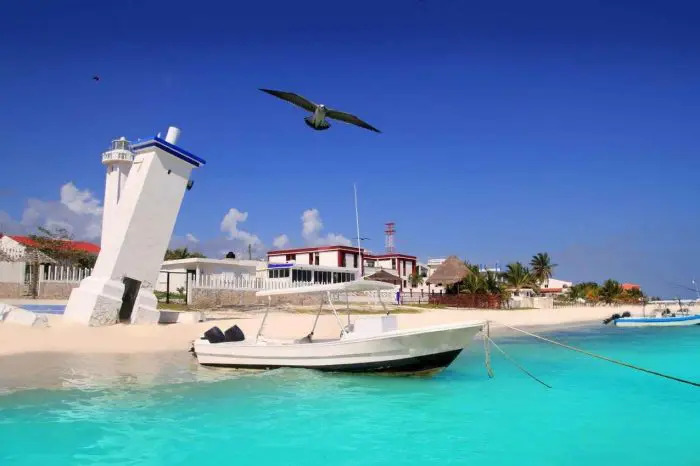 Once everyone has eaten and had a little time to digest their food, perhaps with the help of a margarita, you’ll then sail to the main dock at Isla Mujeres where you’ll disembark for about 2 hours of free time on the island. You can add the option of open bar whilst at the beach club for only $15 per adult. 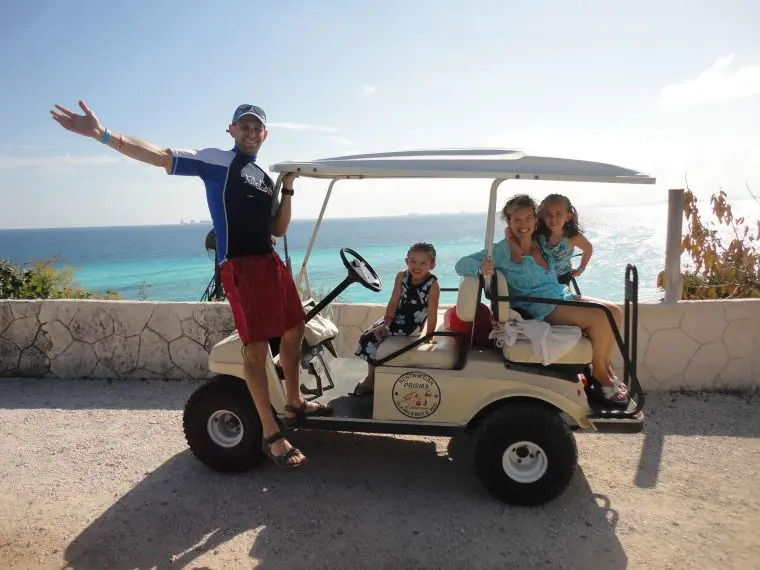 Take a spin on a golf cart, moped or bicycle (all of which can be rented for an additional price), or simply walk through the town and along the beach and take in the small town vibe and undeniable charm of Isla Mujeres. Please note: you’ll need to take along a driver’s license and credit card (or sufficient cash for a deposit) if you do decide to rent a vehicle. 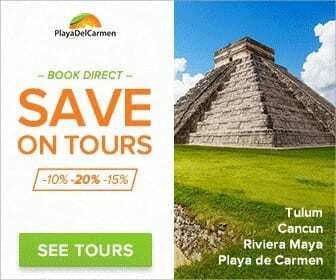 Afterwards, you’ll head back to the catamaran for the approximately thirty-minute sail back to Cancun and from there your transfer back to your hotel in Playa del Carmen. On our Isla Contoy and Isla Mujeres tour, you can visit two islands in one day! 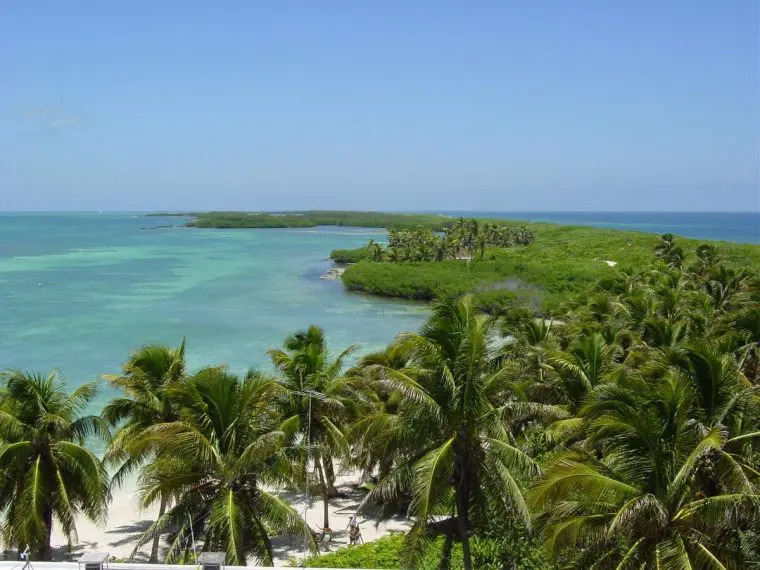 Discover the ecological paradise waiting for you on Isla Contoy. Here you will get to see an incredible nature reserve full of over a 100 species of birds and other wildlife. 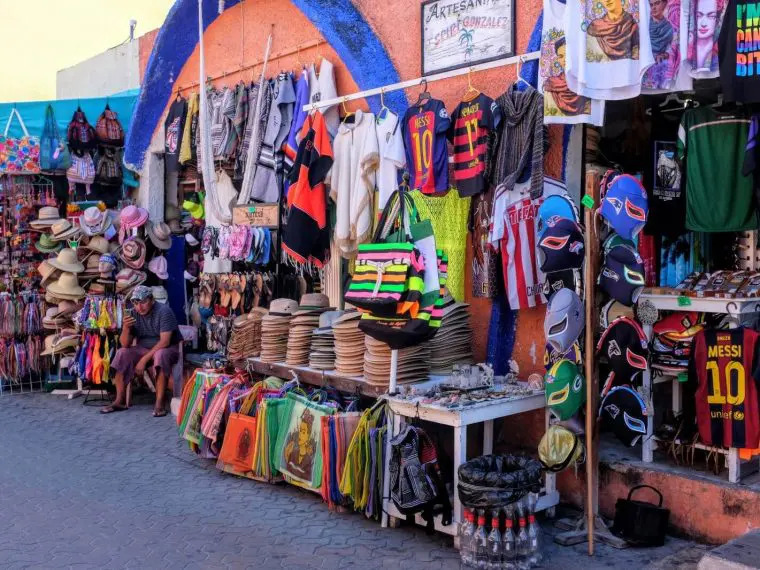 Then head over to Isla Mujeres, where you can buy souvenirs and take a stroll in the quaint downtown area. 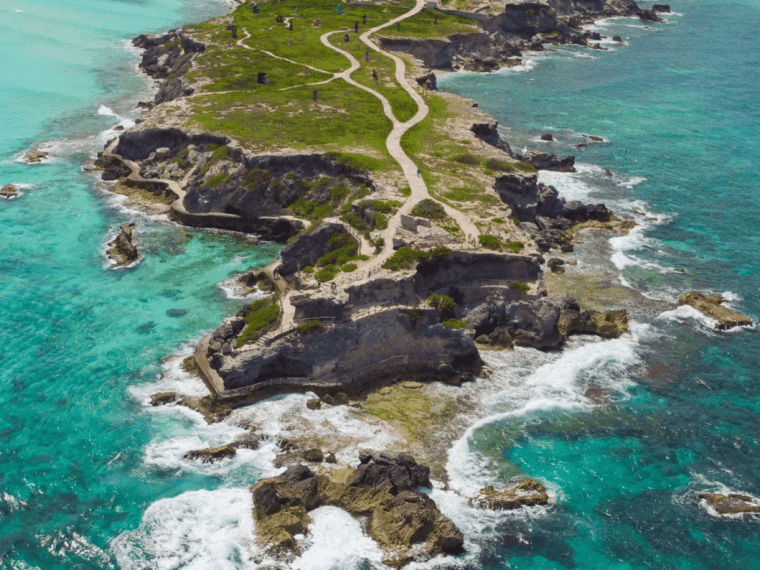 Getting to and around Isla Mujeres is super easy and affordable. Here’s how. The only way to get to the island is to catch the ferry from Cancun. 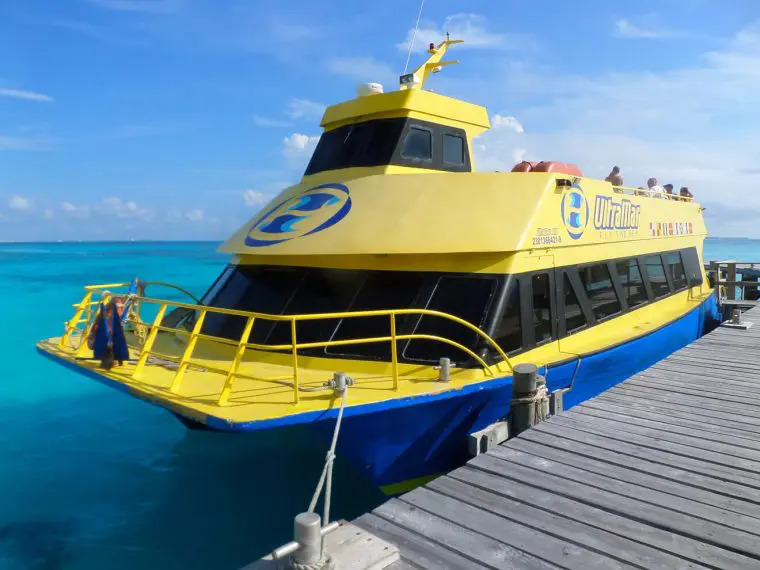 The Ultramar ferry dock is located in Puerto Juarez, just a few minutes from downtown Cancun. The boats leave every half hour from 5.00 am until 9.00 pm and every hour after that. It takes around 15 minutes and costs 80 pesos ($4) one way. I would highly recommend renting a golf buggy on the island. 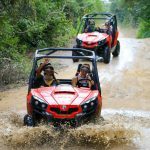 It’s the best way to explore every inch of Isla Mujeres at your own pace, plus it’s a lot of fun to drive. Prices for all day are around $45 US (you can rent them for less time if you wish). There are lots and lots of places to chose from. If they are asking for more they are overcharging you. Normal hours are from 9 am to 5 pm. 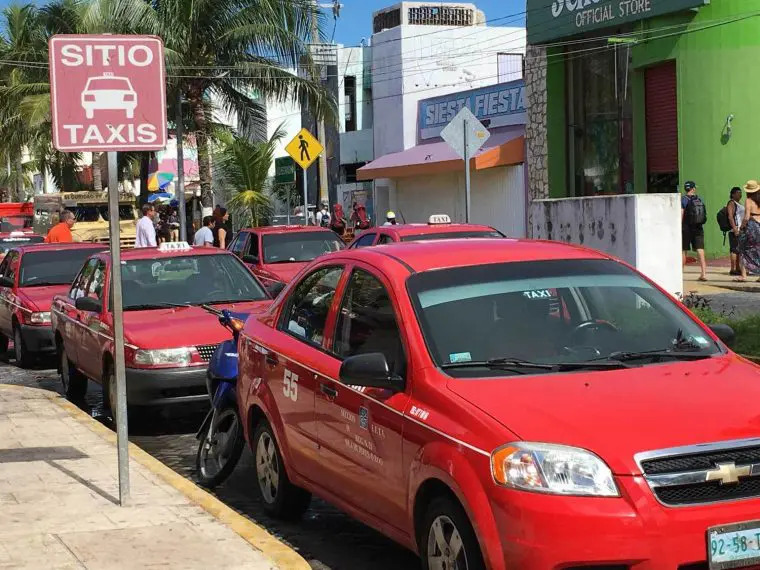 Taxies will be available on the island they are cheap and in abundance, you can find most of them downtown, but they will take you anywhere you need to go and usually charge 20-40 pesos. There are buses transporting people around the island for a very low cost (4 pesos). The bus route starts behind the market in downtown and circles the outer roads of downtown, stopping near the ferry docks. You can pretty much flag the buses at any point and they will stop for you. 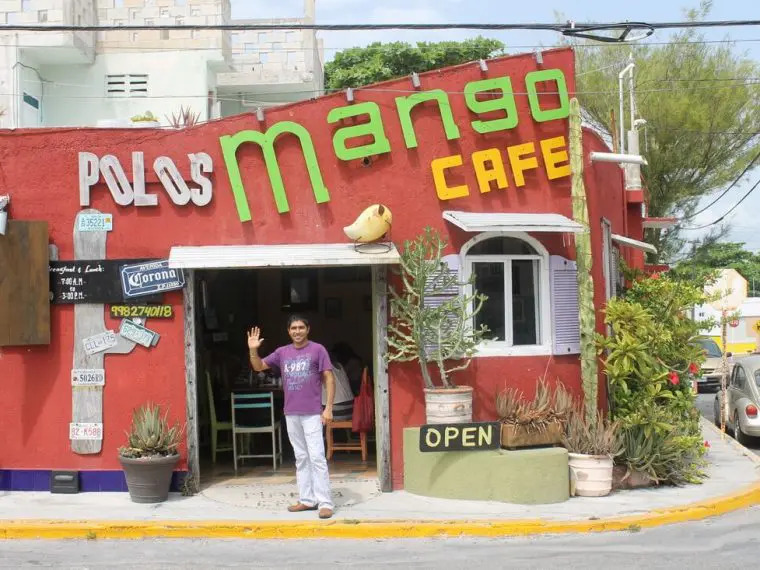 Although Isla produces few local crafts, the streets are filled with souvenir shops selling cheap T-shirts, garish ceramics, and seashells glued onto a variety of objects. Amid all the junk you may find good Mexican folk art, hammocks, textiles, and silver jewelry. Most stores are small family operations that don’t take credit cards, but almost everyone gladly accepts American dollars. If you’re craving some island time, and let’s be honest, who isn’t, then there are two close locations to choose from. 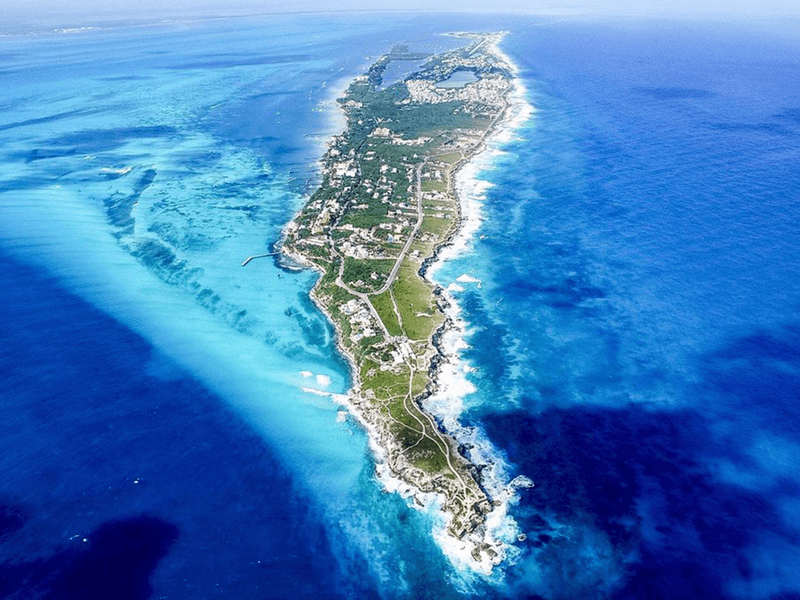 Isla Mujeres and Cozumel are two very different islands each possessing their own kind of charm. Cozumel is a much bigger island to navigate. To do it properly I’d recommend staying at least a few days or renting a car, as taxis can be expensive here. The beaches are rockier and the downtown area is also much busier than Isla because of the number of cruise ships that port there. Cozumel is great for travelers who wish to go diving or snorkeling as it undoubtedly boasts some of the best reefs in the world. Isla is a more developed but much smaller and laid-back island. No cruise ships port here, just catamarans and ferries. You can navigate the entire island by golf-buggy in under 3 hours easily. 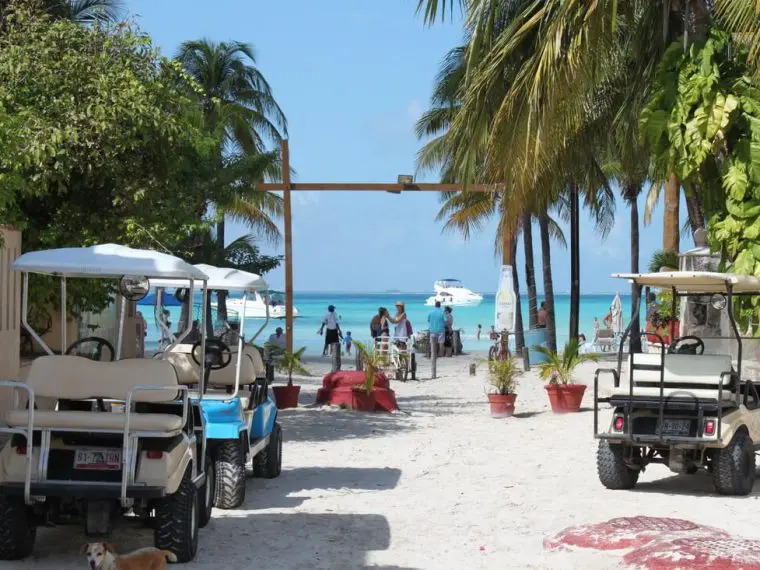 The beaches are soft, powdery, and white, with tons of cool beach bars perched neatly on the sands all within close proximity to the hotels and hostels on the island. It’s compact, houses many great restaurants, and offers cheap shopping options. The only downside to Isla is that the snorkeling is not in the same league as Cozumel, but the sublime colors in the water sure do make up for it! Isla Mujeres is a beautiful place we hope you enjoy island hopping as much as we do. Don’t forget to follow us on Facebook and Twitter to keep up with the latest news in the region. 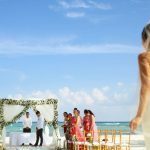 How to Plan Your Destination Wedding in Mexico! 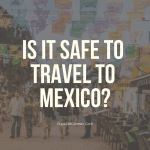 Is Isla Mujeres safe for a woman traveling alone? Hey Dianna, yes I felt 100% safe, I stayed in a hostel and met so many cool people! It’s a hotspot for tourists too so you will be in good company. Have you ever had any one ask about hiring a taxi and driver for the day? We were going to rent a golf cart, but we want to have drinks during the day and we see lots of warnings about drinking and driving. Hey Peggy, thank you for reaching out. 🙂 No one has ever really asked about hiring them for the day but I don’t see why it isn’t possible. 🙂 There will be lots of taxi drivers around to ask, or they may just provide you with their card and number, people will also be around to help so it depends on where you plan on going? Golf carts are very easy to drive. 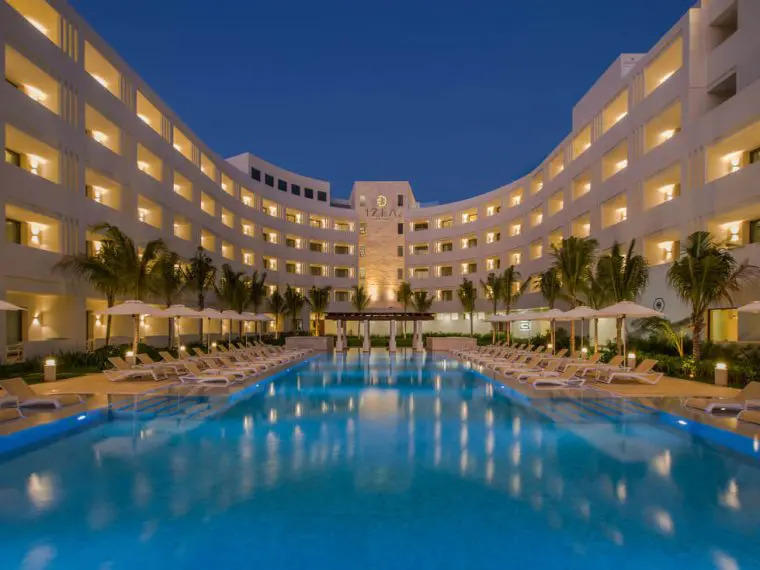 My Honest Review of The Paradisus Hotel in Playa del Carmen (La Perla & La Esmeralda) 2019!